After years of heavy lending to new fossil fuel projects, and being the only “big four” bank to have failed to distance itself from the proposed Adani Carmichael mega coal mine, we decided it was about time the bank’s marketing caught up with the reality of their fossil fuel lending. 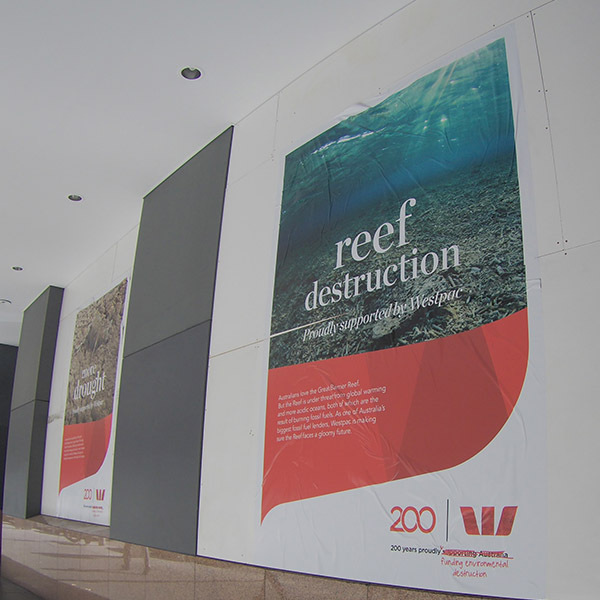 So a few activists went out and rebranded one of Westpac’s branches this week to be a little bit more honest about their sustainability criteria. Check out the results below! Right now, Westpac is working on an update to its climate change policies and action plans. This is a major opportunity to cut off another source of potential funding for the Adani Carmichael coal mine, as well as drag Westpac’s polices on climate into line with their rhetoric of wanting to support an economy that limits global warming to less than 2ºC. We need to act fast: Contact Westpac today using the form below to demand that their updated climate policy clearly rules out lending to new fossil fuel projects, starting with the proposed Adani Carmichael mega coal mine! Dear Westpac, Want to be taken seriously on sustainability? Rule out financing Carmichael. I see that Westpac is now the only major Australian bank that hasn’t distanced itself from the proposed Carmichael mega coal mine. For a bank that talks up its former sustainability credentials at every opportunity, this is a sad reflection of how far you have slipped behind your competitors. As a customer of Westpac this is of great concern to me. By now you must surely be aware of the numerous environmental and social impacts, and financial risks, that would make this project an absolute disaster. But your failure to clearly rule out financing Carmichael when others have taken a stand against the mine makes it appear you are attempting to conceal your intent to finance the proposed coal mine. I understand that you are developing an update to your plans and policies on climate change. As far as I am concerned, this is where you will, once and for all, make your position on Carmichael known. Given your commitment to operate in a manner that supports an economy that limits global warming to less than two degrees, it must be clear from your new climate policy that all new fossil fuel projects like Carmichael are off limits. If you can’t do this, I would have to wonder what the last two years of internal research into climate change has actually been for. While other banks begin acknowledging the constraints of the global carbon budget, committing to phase down their exposure to the fossil fuel sector, some placing blanket bans on coal mines and power plants, Westpac has utterly failed to keep pace. Your climate policy update will demonstrate to the community whether or not you remain committed to environmental sustainability. Please respond as soon as possible with answers to the following questions: 1. Does Westpac acknowledge that limiting global warming to less than 2˚C means the world must adhere to a limited “budget” of greenhouse gas emissions? 2. Will Westpac refuse to participate in deals for projects that expand the scale of the fossil fuel industry? 3. Can Westpac commit to reducing its exposure to fossil fuels year on year, every year from now on? 4. Will Westpac rule out supporting the Adani Carmichael coal mine? I look forward to your response, which will directly address my four questions. Dear Westpac, Want to be taken seriously on sustainability? Rule out financing Carmichael. I see that Westpac is now the only major Australian bank that hasn’t distanced itself from the proposed Carmichael mega coal mine. For a bank that talks up its former sustainability credentials at every opportunity, this is a sad reflection of how far you have slipped behind your competitors. As a shareholder of Westpac this is of great concern to me. By now you must surely be aware of the numerous environmental and social impacts, and financial risks, that would make this project an absolute disaster. But your failure to clearly rule out financing Carmichael when others have taken a stand against the mine makes it appear you are attempting to conceal your intent to finance the proposed coal mine. I understand that you are developing an update to your plans and policies on climate change. As far as I am concerned, this is where you will, once and for all, make your position on Carmichael known. Given your commitment to operate in a manner that supports an economy that limits global warming to less than two degrees, it must be clear from your new climate policy that all new fossil fuel projects like Carmichael are off limits. If you can’t do this, I would have to wonder what the last two years of internal research into climate change has actually been for. While other banks begin acknowledging the constraints of the global carbon budget, committing to phase down their exposure to the fossil fuel sector, some placing blanket bans on coal mines and power plants, Westpac has utterly failed to keep pace. Your climate policy update will demonstrate to the community whether or not you remain committed to environmental sustainability. Please respond as soon as possible with answers to the following questions: 1. Does Westpac acknowledge that limiting global warming to less than 2˚C means the world must adhere to a limited “budget” of greenhouse gas emissions? 2. Will Westpac refuse to participate in deals for projects that expand the scale of the fossil fuel industry? 3. Can Westpac commit to reducing its exposure to fossil fuels year on year, every year from now on? 4. Will Westpac rule out supporting the Adani Carmichael coal mine? I look forward to your response, which will directly address my four questions. Dear Westpac, Want to be taken seriously on sustainability? Rule out financing Carmichael. I see that Westpac is now the only major Australian bank that hasn’t distanced itself from the proposed Carmichael mega coal mine. For a bank that talks up its former sustainability credentials at every opportunity, this is a sad reflection of how far you have slipped behind your competitors. As a shareholder and customer of Westpac this is of great concern to me. By now you must surely be aware of the numerous environmental and social impacts, and financial risks, that would make this project an absolute disaster. But your failure to clearly rule out financing Carmichael when others have taken a stand against the mine makes it appear you are attempting to conceal your intent to finance the proposed coal mine. I understand that you are developing an update to your plans and policies on climate change. As far as I am concerned, this is where you will, once and for all, make your position on Carmichael known. Given your commitment to operate in a manner that supports an economy that limits global warming to less than two degrees, it must be clear from your new climate policy that all new fossil fuel projects like Carmichael are off limits. If you can’t do this, I would have to wonder what the last two years of internal research into climate change has actually been for. While other banks begin acknowledging the constraints of the global carbon budget, committing to phase down their exposure to the fossil fuel sector, some placing blanket bans on coal mines and power plants, Westpac has utterly failed to keep pace. Your climate policy update will demonstrate to the community whether or not you remain committed to environmental sustainability. Please respond as soon as possible with answers to the following questions: 1. Does Westpac acknowledge that limiting global warming to less than 2˚C means the world must adhere to a limited “budget” of greenhouse gas emissions? 2. Will Westpac refuse to participate in deals for projects that expand the scale of the fossil fuel industry? 3. Can Westpac commit to reducing its exposure to fossil fuels year on year, every year from now on? 4. Will Westpac rule out supporting the Adani Carmichael coal mine? I look forward to your response, which will directly address my four questions. Dear Westpac, Want to be taken seriously on sustainability? Rule out financing Carmichael. I see that Westpac is now the only major Australian bank that hasn’t distanced itself from the proposed Carmichael mega coal mine. For a bank that talks up its former sustainability credentials at every opportunity, this is a sad reflection of how far you have slipped behind your competitors. By now you must surely be aware of the numerous environmental and social impacts, and financial risks, that would make this project an absolute disaster. But your failure to clearly rule out financing Carmichael when others have taken a stand against the mine makes it appear you are attempting to conceal your intent to finance the proposed coal mine. I understand that you are developing an update to your plans and policies on climate change. As far as I am concerned, this is where you will, once and for all, make your position on Carmichael known. Given your commitment to operate in a manner that supports an economy that limits global warming to less than two degrees, it must be clear from your new climate policy that all new fossil fuel projects like Carmichael are off limits. If you can’t do this, I would have to wonder what the last two years of internal research into climate change has actually been for. While other banks begin acknowledging the constraints of the global carbon budget, committing to phase down their exposure to the fossil fuel sector, some placing blanket bans on coal mines and power plants, Westpac has utterly failed to keep pace. Your climate policy update will demonstrate to the community whether or not you remain committed to environmental sustainability. Please respond as soon as possible with answers to the following questions: 1. Does Westpac acknowledge that limiting global warming to less than 2˚C means the world must adhere to a limited “budget” of greenhouse gas emissions? 2. Will Westpac refuse to participate in deals for projects that expand the scale of the fossil fuel industry? 3. Can Westpac commit to reducing its exposure to fossil fuels year on year, every year from now on? 4. Will Westpac rule out supporting the Adani Carmichael coal mine? I look forward to your response, which will directly address my four questions.